Do you remember the first time you met Mickey Mouse? Or do you know someone who dreams of meeting their favorite princess or a character from a galaxy far, far away? A trip to Walt Disney World© is as magical as it is memorable and no experience adds to the magic more than meeting your favorite character, princess, or villain. However, quite a bit has changed over the years when it comes to meeting Mickey and the gang. Most characters do not roam the parks but have set spots or venues where they reside and you line up to meet them, grab an autograph and snap a picture. There are four Disney Parks at Disney World and not all characters can be found at one single park. Being prepared ahead of time with an idea of which characters are at the top of the list will save you time and ensure that you capture moments with the favorites on your list. So, where do you start? Before leaving for the house of the mouse, do a little research on where to find the characters you are most interested in meeting. You can find information on specific park attractions, shows and character meet and greets on the Walt Disney World© website. Or you can ask one of us! To help you in your quest to meet Mickey, a Princess or two, Chewbacca or Winnie the Pooh, here are our go-to resources for character hunting at Disney World and tips to magical moments. 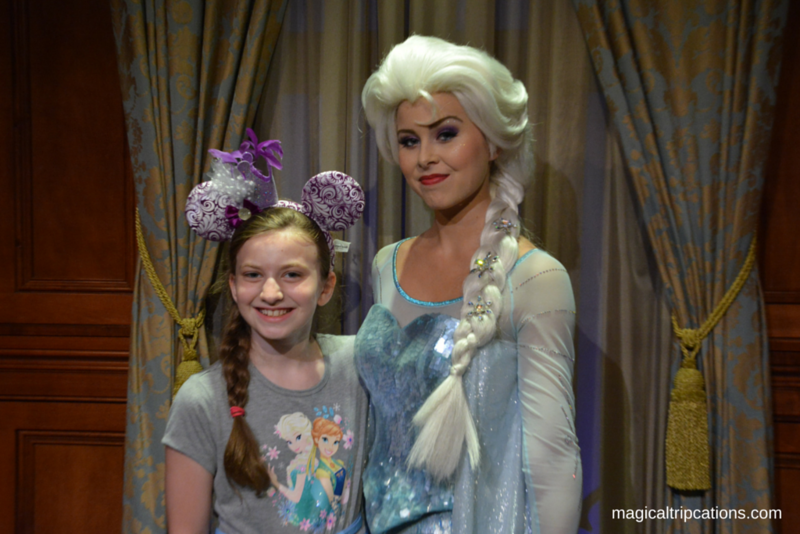 FastPass+ Reservation – Some character meet and greets, such as meeting Anna and Elsa, are available for the FastPass+ reservation service. Queues to meet these lovely princesses can grow beyond a 2+ hour wait in peak season so, if you can use one of your FastPass+ options to meet Anna and Elsa, we highly recommend it. If the FastPass+ option is available for that once in a lifetime or must meet, we would opt to use the FastPass+ reservation to make it happen! My Disney Experience App – Downloading and using the My Disney Experience App on your smartphone is a great way to track down your favorite characters in real time. With a couple of taps, you will be able to find characters in the park or close by along with the current wait time. You can even use this app before you ever leave home to get an idea of wait times for all attractions and to get the know the “lay of the land”. Times Guide – Pick up a Times Guide along with a Park Map at each park upon entry. The guide will list Parade and Show times, Character location and greeting times, Special Hours for the day and more. Guest Relations – Each park has a Guest Relations area located at the front of each park. You can stop by and speak to a Cast Member who can give you an idea of when, where and what time you could locate a specific character. Meeting Marie was magical! 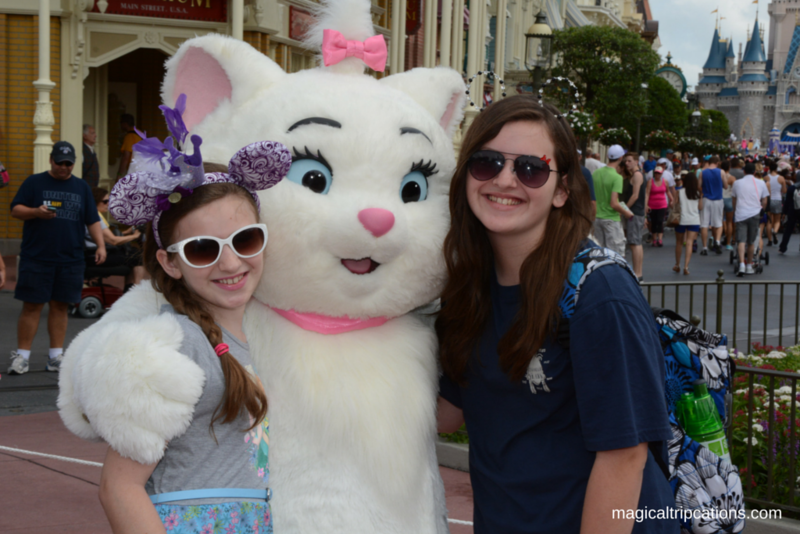 We love the Aristocats! Have an autograph book. Most of the characters will sign autographs, but not all. You can purchase an autograph book at souvenir shops and kiosks in the Parks and Resorts or bring one from home or make one. Bring a pen – preferably a large sharpie marker so that a character with big gloves or paws can grip the pen. Have both of these items out while standing in line for a smoother experience. Have your camera ready to go. All of the characters have an assigned Cast Member to keep the lines organized and moving. There will also be a Disney PhotoPass Photographer who will snap posed shots as well as interactions leading up to your greeting. If staying on property, the photographer will tap your MagicBand to link the photo to you. Or if not, the photographer will hand you a PhotoPass card that will give you directions on how to access and purchase any photos taken throughout the parks (you can use the same card throughout your stay so that you aren’t trying to keep up with multiple cards). The Cast Member will also happily take the picture with your camera and/or smartphone at no cost! Have a FastPass+ reservation where available for those must meet characters. FastPass+ reservations can be made 60-days in advance of check-in if staying at a resort hotel or 30-days in advance if staying outside of Disney World. Meeting Elsa at Magic Kingdom. There are many different Character Meal dining options at Disney World from dining with royalty to Mickey and the gang to Disney Junior Pals for breakfast, lunch or dinner. Doing a little research on the Walt Disney World© website will give you details on the cost of each meal, menus and the characters typically available at each Character Meal. If you have a Disney Dining Plan that includes table-service credits, you can utilize these credits for Character Meals. Each meal will use 1 table-service credit with the exception of dining at Cinderella’s Royal Table which will utilize 2 table-service credits. However, if you did not purchase the dining plan, you can make reservations through your My Disney Experience account with a credit card or by calling (407) WDW-DINE 939-3463. Make your reservation/s as soon as you can. Disney World is a busy place with thousands of guests visiting at any give time. It is very difficult to walk up to a restaurant and request a table without a very long wait if you can get a table at all. So, Disney recommends making reservations well ahead of your trip. If staying at a resort hotel, you can make your Advanced Dining Reservations (ADRs) 180-days ahead of check-in for up to ten days of your trip. If not staying at a resort hotel, you can make your ADRs 180-days ahead of check-in but will have to call back or book online each day at the 180-day mark. You will dine like you would at any other table-service meal by sitting down to a table with a server but the best part is that each of the featured characters will visit your table one at a time. No lines or chasing down characters needed! 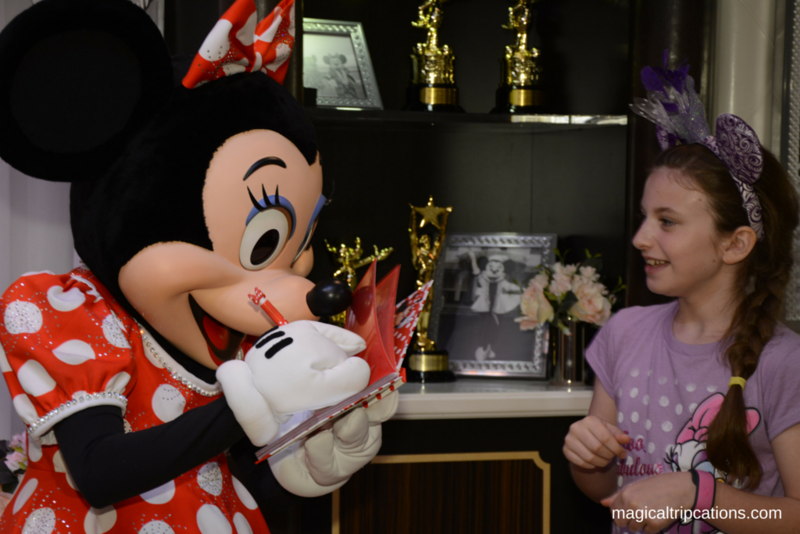 Your party will be able to interact with the character, obtain autographs and pictures and have a magical time. For most meals, you will be on your own as far as taking photos but there will be a Cast Member in tow to take a photo of your entire group and you usually have time to take several pics. If dining at Cinderella’s Royal Table, you and your party will take a photo with Cinderella exclusively prior to being seated and a PhotoPass Photographer will be on hand to capture this moment! Menus and style vary for each character meal. Some meals are served buffet style, while others will be served family style or some allow you to select from menu options. Don’t shy away from Character Meals if you don’t have children or are traveling with adults only. 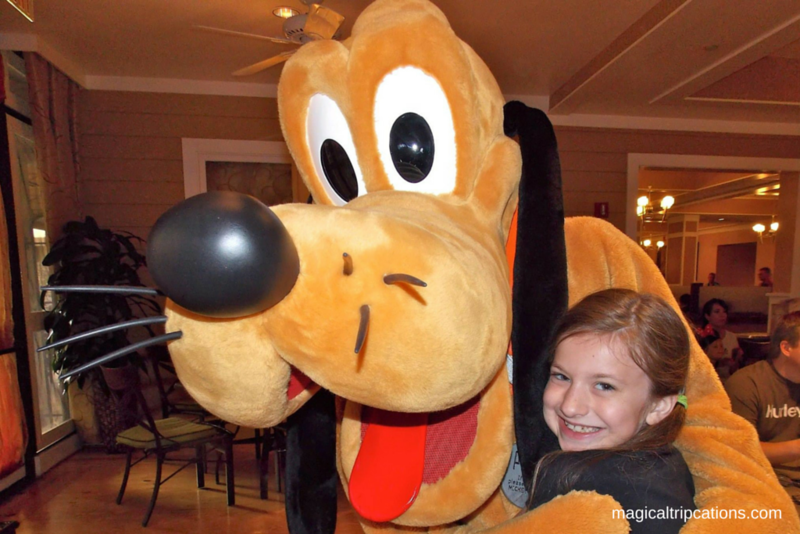 Characters love meeting everyone and will interact with you whether you are young or young at heart! Breakfast at Cinderella’s Royal Table at Magic Kingdom. Children can wear their favorite costume. Unfortunately, adults are not allowed to wear costumes to the parks but feel free to wear your favorite ears and t-shirt to get into the spirit. Have your autograph book ready. Characters will sign all of your autograph books and interact with you for a brief time. Have your camera ready the moment you sit down. Your server will let you know how long it will be until the characters start approaching your table so that you can get an idea of when to go to the buffet, etc. Once the characters begin approaching your table, don’t just wait for the posed shot of your family with the character. Start snapping pictures as soon as they approach your table. Some of the most magical moments happen when they interact with your and your family! 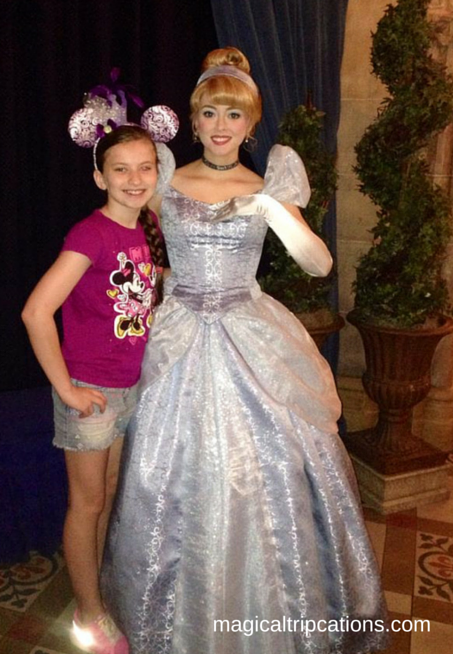 Meeting your favorite character is magical! 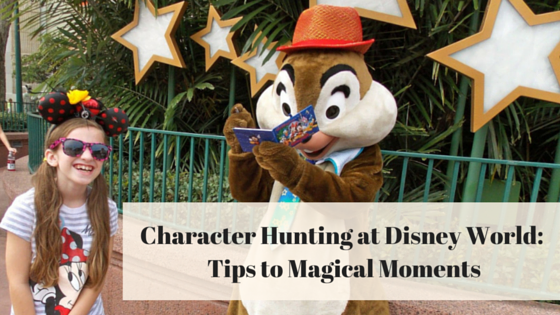 Character hunting at Disney World is so fun and can provide some of the most cherished memories of your trip. Each character has a personality all their own and it is on full display while interacting with guests both big and small. We’ve even found ourselves a bit “star struck” during these moments. And why not? These beloved characters have been in our books, movies, and on our TV throughout our lives, too, and meeting them can be like meeting a movie star. Embrace it for all its worth. Seeing your child’s reaction to meeting one of their heroes or best friends is beyond magical and provides memories that will last a life time for you, too. Bonus Tip: Contact us to book and plan your next Magical Tripcation to the Walt Disney World Resort©. Our team of Travel Planners will provide you with complimentary planning services that will not only get you on the VIP list but will save you time and research by doing the planning for you!